2nd Prize Article: SHADOWFAX Journey in Lords Mobile! My name is Eleanorva Jerome but my friends call me Michi. 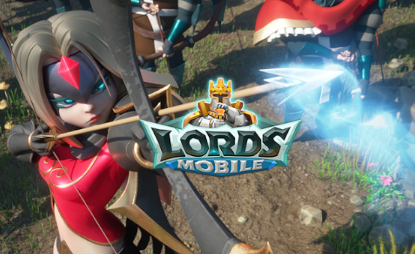 I have been playing Lords Mobile for almost three months now. I found the game in Play Store after searching and deciding for quite some time. The game gains my interest when the feature said it is easy to upgrades and is a real-time game.This means that I will be dealing with players around the world the moment I start to play. At first, I started it and put my identity as Shadowfax, I choose the name after the Lords of the Ring movie. Shadowfax means the King of all Horses and Gandalf friend. Back to the game, without any clue about how to play, I also don't like reading too much instruction so I skipped a lot and clicking button randomly that makes me confused especially the arrows coming all over the kingdom but as I finally reads and followed the instructions I can finally bring myself as an independent player. The kingdom I am in is K246 which is Kingdom Nalux. I joined my first guild and quite surprised because there are so many races in the game. I am a newly born to the kingdom and I learn that the kingdom has its own ruler and every guild also have their own rules to lead the members, so at that time I only know how to follow the rules. Unfortunately, we have been attacked a lot and our guild leader there is quite and never care for his people. One of the active members asks me and few of my friends to join another guild which is a good friend of him. I still remember he teaches me to focus on military upgrades and monster hunt research so I can gain my might even faster. 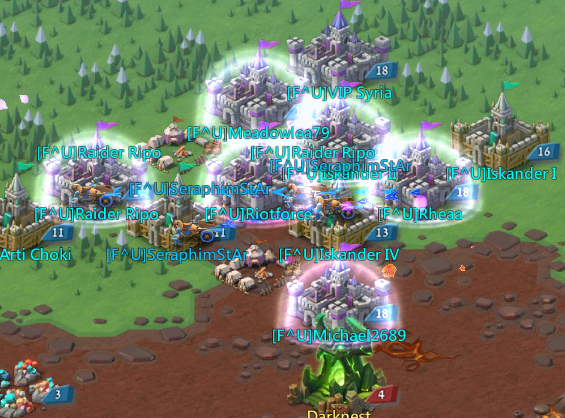 After that we leave the guild and apply to another guild, we also teleport there using relocator. That was my first time too and my first teleport was a failure because I accidentally used the random relocator that makes me ported to somewhere else. The guild leader that I apply ask me this question "Can you relocate to the hive?" well I cannot forget that words because the leader is a really good one and he never leaves his faithful people behind, I will talk more about it soon. As I gather my guild coins when I don't have enough gems to buy one relocator I can finally transfer to the hive through the coordinate the guild leader gave me. 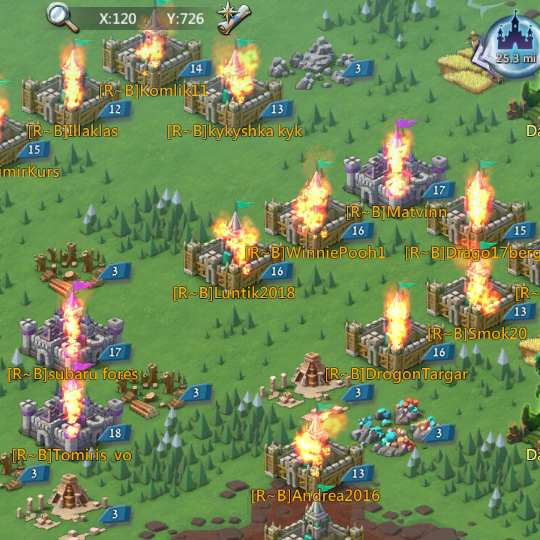 Situation 2: We Burn Them as it is a War Game Against Enemy. 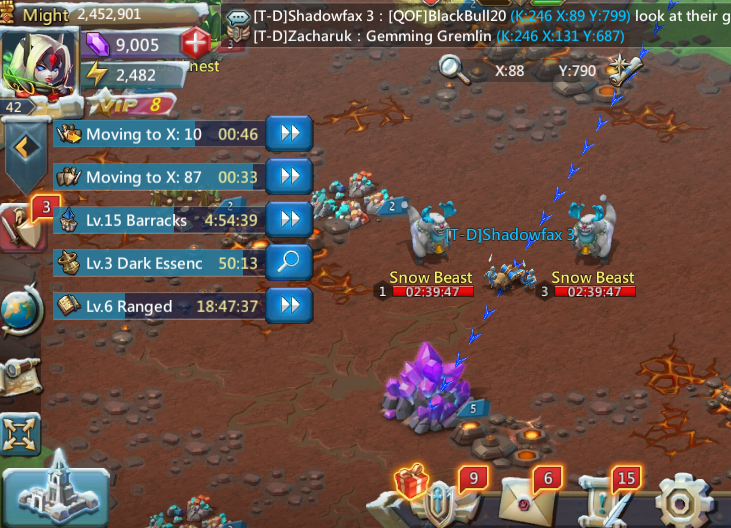 After a while I learn a lot more about this game where we can decide on how to manage our own guild, following order from the leaders with Rank 5 and Rank 4, making alliance with another guild so they don't attack us. I also learned new short forms of languages for example (NAP: NON-ATTACK PARTY). We also defend ourselves from enemy by putting a shield on or if another member did not have a shield, they can send their troops to a shielded one as a garrisoned for the time being or doing a fake long rally against darknest. I also been taught to always put my heroes in shelter lf I go offline as a precautions step to prevent them being captured by enemy that has the probability to be killed. Keeping your heroes alive is very important because they represent your might and turf conditions. If they are killed then it will affect your whole castle. 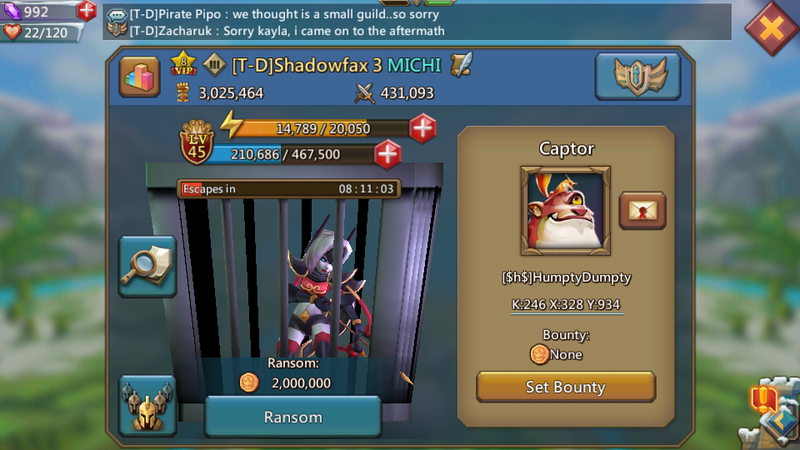 There is case if the leader have been captured can be release when asking for reconciliation or pay ransom with the enemy that have your hero captives. The most important part in my gaming journey is when I get to know them well through guild chat exchanging names, locations, country, favorite movies and small fights has grown us to become family. One of the members also said through guild mail if we really like to play this game that we would install wegamers App as it helps with points and bundle contains gifts for the game. Also, the guild chat can be connected through the apps. That is how I know about wegamers and explore the world chat without boundaries where I can join so many groups, following people or being followed by people from different races and country that uses different languages. This wegamers and Lords Mobile game is really helping as it has auto translation. The best part is out of 90 members in the guild we made a family of 12 and made ourselves a group name as "THE FAMILY" in wegamers. We stand for each other, we go and teleport to another guild in and out and join another hive together. This is what I say about our guild leaders that never leave the family. Even the guild leader ask the family to leave with him from the guild he made himself. That happened when he demote himself and put someone else in charge as a new guild leader. The situations back then made a lot of people in the guild did not listen. Our leaving made the guild falls and people are searching new guild and at that moment new people also entering the guild. While the family are on the journey together we experience mixing guilds with another and of course we still face a lot of people dramas that somehow irritate us but that is a part of the journey that makes it even more interesting! It makes the game more alive. After a while, we decided to come back to our old guild again and now we are home together again like the old times. Through wegamers we communicate more and exchange life details even to personal stories. This is the first time for me to have engaged with people from different countries like this.This opportunity teaches me to learn other people ways to communicate. I am truly happy with this, in this game I am cool being an open-minded person because dirty talks are commonly used as a joke. I open my mind and see their way of approach, that is when I can see the good in people behind all the talks. We care for each other and we defend each other from enemy's attack. They are the main reason why Im still playing Lords Mobile, it is because of the people that we involve with. Before I end this, I would like to thank the Lords Mobile game organizer and wegamers Team for announcing this contest. As soon as I read the writing contest I am already excited to tell my story, and all that I have wrote are truly from my own experience and sweet memories especially with the family that I found. I don't really care if I don't win this contest but I am really happy for this opportunity to share my thoughts about the game. I wish you all the best in organizing the game. Because you have help change people's live to even more meaningful. I dare to tell you this because some of us in the family suffer chronic pain that leads them to insomnia.Through this game and wegamers we are able to share our life stories and somehow make us even closer. We also wish if we could meet up in person someday. Now you know this game bring good change to our lives and it is not just a game but in here we have found a Family. Thank you for reading my gaming Journey!